The first part of the series is entitled “Kierkegaard’s Sources.” This category includes articles that perform source-work research in order to discover and document the numerous sources of Kierkegaard’s thought. 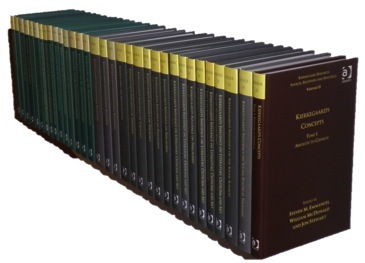 These are divided into individual volumes according to the historical period of the sources in question, beginning with Kierkegaard’s use of the Bible and ending with his use of Danish works from his own time. This part of the series is conceived, on the one hand, as a kind of reference work, which attempts to set forth factual information about specific places in Kierkegaard’s authorship where he quotes or alludes to the given figures or themes. It is, on the other hand, also a critical work, which features thesis-oriented and interpretive articles about Kierkegaard’s reception of the given figures in a way that stimulates further research. Altogether this section contains 15 individual tomes. Mads Sohl Jessen, Søren Kierkegaard Newsletter, no. 58, November 2011, pp. 4-5.